Chef’s Log 44: Po-Tato(‘s) Bhajji | The Spoon From Outer Space. Some restaurants are more than just restaurants. They withstand the trials of time. They witness history as it is being made. They are survivors. They are landmarks. And most importantly, they have been serving the same dishes for so long that they have managed to achieve utter perfection. Practice makes a meal perfect- this is the first thing that Gastronomicans are taught in Culinary Creativity (which was my favourite subject in school. Well, maybe after Gluttony 101). And it appears that ‘Tato’- a rather unassuming yet wildly popular café in Panjim is an example of this. Certainly, the quality of its food can be gauged from the fact that it has been appreciated across generations. As you can imagine, I was quite curious. So I attempted the ‘thali’- a rather fascinating concept which is apparently distinctly Indian. This ‘thali’ contains a variety of dishes-usually three I think- in small quantities, and is served with both the Indian food staples- roti and rice. This means that the diner has the ability to mix and match the various dishes and accompaniments- a brilliant example of culinary creativity I would say. 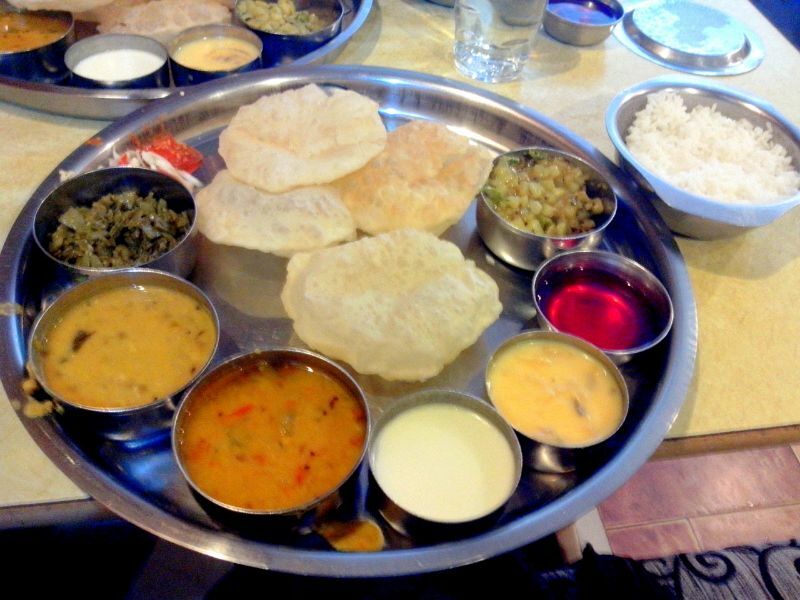 What makes Tato’s thali different from the typical Indian thali? Well, firstly, you can choose to have ‘puris’ instead of rotis. Puris are crispy, light, and fried. And as we all know, fried is a synonym for delicious. Secondly, one of the dishes in the thali is Tato’s signature potato ‘bhajji’- a sinfully oily mixture of soft, gooey potatoes and fiery chillis, absolutely packed with stunning, full-bodied flavours. It was so good that for a moment I actually considered turning vegetarian (but then I remembered what meat tastes like). And lastly, what sets this thali apart is that it comes with two different kinds of daal- one savoury and one slightly sweet. The second bhajji in the thali (the potato bhajji being the first) was made of ‘gavar’ which is a kind of vegetable I’m told. The only thing I know for certain about this ‘gavar’ is that it tasted delicious. The thali also contained a delightful banana custard dessert, a side of yogurt, and kokum (for after the meal). I must say, Cafe Tato really knows how to spoil their customer- this was a thali fit for a king. For anyone interested in food so good that it’s managed to stick around for…well I didn’t bother to actually do the research, but… a significant amount of human years, this is the place.